A vacation rental that is sure to please!!! Our vacation condo is situated on the banks of the Chattahoochee River where you can relax on the screened deck and have a meal or snack while enjoying the sights and sounds of the Chattahoochee River cascading over the rocks. After relaxing a spell you may want to take a refreshing dip in the river, go next door to the festhalle for some bingo or dancing, across the street for some miniature golf, to Main St. for a horse drawn carriage ride and some shopping, take a hike on one of the many trails close by ,or a drive through the beautiful North Georgia Mountains. Then back to our home which is filled with light from the many windows which offer amazing RIVER VIEWS from the living area, dining area, and the master bedroom. The master bedroom has a gas fireplace(Oct.-Feb.), I home docking station, King bed, TV, private bath with whirlpool tub, separate shower, and double sinks. The second bedroom has a queen bed, TV, and private bath with whirlpool tub/shower combo. The kitchen is well equipped and has granite counters and stainless appliances. The living room has a 43' cable TV which you can enjoy from the leather sofa or from the dining table. Whether you are looking for adventure or relaxation we hope you enjoy your vacation!!!! We have enjoyed visiting Helen for many years and in December of 2010 we purchased our vacation home in Helen. 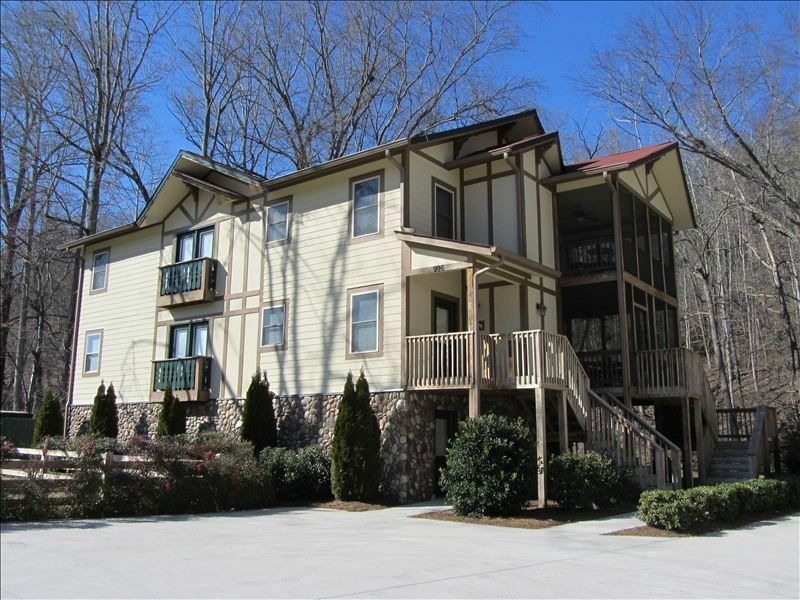 It is convenient to the Atlanta area and we enjoy the river and surrounding mountains. We love to hike and especially enjoy the trails to the waterfalls. We enjoy our time at our vacation home and hope you will too. No phone service is provided Guest must have their personal cell phone in case of emergency. Wi-fi is provided but not guaranteed. The Wi-fi code is at the bottom of the TV channel list. This was our second stay in this same unit. It’s very convenient to town and steps from the river. The condo is clean and the beds are comfortable. It is very modern and not run down in the least. We always enjoy the river being in the backyard. You can walk to putt-putt across the street and also to the town and restaurants. Great place to stay and enjoy Helen! The property is well maintained and is the perfect location to walk to all the sites in Helen. Right on the river (if you like to fish) and quiet, cozy, and relaxing. This is our second visit to this property and we hope to visit again next year! Thank you!! Enjoyed the Condo very much, well maintained and relaxing which is what we were looking for. Condo is in a terrific location, right on the river and walking distance to all the shops and most of the restaurants. Very nice accommodations, clean and comfortable. Could not have asked for anything better !!! We really enjoyed staying in this beautiful condo! It is well maintained and very clean. It was close enough to walk to shops and restaurants. Thank you Diane for letting us stay in your beautiful condo! The property is just what we needed, as my husband, two boys and I, evacuated our home in Morehead City, NC due to hurricane Florence. We are here for two more unexpected nights, which will make five nights total, as we are unable to return home due to road conditions per flooding. The owner was so generous in allowing us those extra nights free of charge. Her generosity warmed my heart during such a trying time. The view of the river is beautiful. We even took a dip in the chilly water! The property is clean and well stocked for cooking. All is great and we are grateful to have found such a perfect place amist all of our anguish and worry about home.